Hi Surfers, I'm back again after tooooooo long interval. But this is unavoidable for me. My Tiger (Willy CJ2A 1946) is now standing on his foot with full power. I have to change the top portion of the jeep to a flexible one for folding, removal etc. Also minor tinkering and painting job to make it look better. 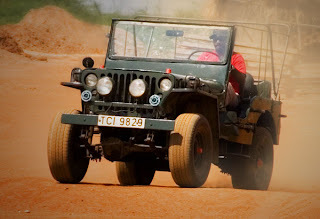 The Jeep had also gone for a Engine transplantation with more powerful Peoguot engine. Yes the jeep is fully ready and doing great. 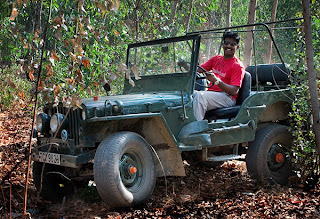 There couple of modification I was doing with it, as I have mentioned earlier I thought that I would take this jeep for Indian explorer program. You know some times our plans may be doomed by the time, this happen to me. I will not be able to keep up my plan as Indian explorer for another 3-5 years. Because I'm now relocated to Singapore the Lion City. But I did visit palani as a part of my plan and made my smaller article for you people. It was nice experience however I had to choose a bad weather (43degree celcious) and we have almosted boiled. Look at this space for my detailed blog about the palani visit, I hope I would do it today or tomorrow. I'm still collecting information for singapore blog because I myself new here and not started to explore anything yet.